Five years after the Sept. 11, 2001 attacks, conspiracy theories abound about what caused Flight 93 to crash. Many people still believe it was shot down. Others say the plane never crashed at all. Team 4's Paul Van Osdol has been looking into some of these theories. Do a Google search on Flight 93 conspiracy and you'll get more than 2 million hits. Some of the theories are wild and easily challenged, but others raise serious questions about shortcomings in the government investigation. The movie "United 93" portrayed government officials as frantic, slow to respond, overwhelmed by events, but conspiracy theorists say the movie failed to tell the real story. 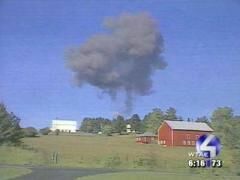 Just one day after Flight 93 crashed, rumors about a government conspiracy were already swirling around Shanksville, Pa. Some of the early conspiracy theories were fueled by witnesses along Indian Lake. Flight 93 went down on just the other side of the lake, and these witnesses say they saw an unidentified white jet circling the crash site just minutes after Flight 93 went down. "We all looked at it and said, 'What's he doing?'" said marina owner Jim Brant. "We had no idea what was happening at that time." Brant, one of the first people at the scene, told Team 4 the day after the crash his comments were picked up by conspiracy theorists, but today, Brant does not buy into a conspiracy. "I don't think there was any outside interference to that plane at all," said Brant. "I don't think there is any conspiracy other than what was in the plane." But the Internet continues to buzz with theories about a government shoot-down, and that's not all. Some have posted articles alleging a famous photo (pictured, above right) taken at the time of the crash is a fake. A retired Army colonel claims there was no plane at all at Shanksville, saying the hole in the ground was far too small for a Boeing 757. Another theory: Flight 93 never crashed but ended up in Cleveland, where the "Zionist controlled NASA Space Agency led the cover-up," the same NASA responsible for "dubious Apollo moon landings." Theories like this flourish in an information vacuum. Researcher Bryan Sacks of the group www.911truth.org does not necessarily believe the government shot down Flight 93, but he says the 9/11 Commission failed to do a thorough investigation. "Most of the commissioners had direct conflicts of interest, ties to the airlines that were involved," said Sacks. He and other researchers also point to an Army seismic study that indicates Flight 93 crashed at 10:06 a.m., three minutes later than the government's official version. "So why is there this three-minute gap? We really don't know," said researcher Paul Thompson. Thompson created a timeline of all the Sept. 11, 2001, events. He points out that it took a half-hour after Flight 93's hijacking for air traffic controllers to notify the military. "They knew the World Trade Center had been hit," said Thompson. "They knew the Pentagon had been hit and yet they don't bother to tell anyone of importance about it? They don't bother to tell the military that this plane has been hijacked? I mean, if you look at that, it just doesn't make sense." And he wonders why authorities never positively identified the remains of the hijackers. "We just labeled them terrorist 'A, B, C and D,'" said Somerset County Coroner Wallace Miller. "Why wasn't the step made to go beyond that and try to identify them name by name?" Van Osdol asked. "We couldn't, because nobody gave us a DNA profile," Miller said. Miller, one of the lead figures in the Flight 93 investigation, still gets occasional late-night calls from conspiracy theorists. He says the evidence does not support a shoot-down. "There's nothing that I saw on the ground that would suggest that," said Miller. "It would seem like there would have been debris, upwind around Greensburg or somewhere like that, but as far as I know, nothing was found." But critics said there are still too many unanswered questions about one of the most momentous events in recent history. "People are interested to know what happened on 9/11 and they do suspect that they're not getting the full story," said Sacks. Van Osdol talked to several relatives of Flight 93 passengers. Most of them are skeptical of conspiracy theories and they support the conclusions of the 9/11 Commission. But some other 9/11 families just put out a DVD called 'Press for Truth,' airing their concerns about the government investigation.